The night was very bright; a sharp frosty air whistled from the east, and the moon and the stars sparkled like frozen sleet in the sun. After the governor had scraped off the worst part of the slush, cleaned my face, and did the best he could for me, he shelled out the contents of the sack upon the side o’ the wessel, and commenced countin’ and feelin’ the pieces of silver with wonderful pleasure. The above is the earliest literary mention of the “lump o’ labour” that I have ever found. “One-eyed” Jack Hogg is telling the story of the time when he was 10-years old and there was a fire at the silversmith’s shop at the corner of Adam Street.The melted silver was carried by the water into the storm drain. 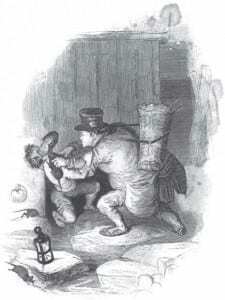 Jack’s father, a scavenger (the “mudlark”), sends him into the sewer to recover the lumps of silver but on his way back Jack drops his lantern and is immediately attacked by the sewer rats. He runs to the exit where his father beats off the last clinging rats and then cleans him up in the river. The retrieved “swag” is enough to keep the family in relative luxury for the next six months. The preceding chapters of the book tell the story of a visiting professor of phrenology and the ruse played on him using a plaster cast from a Swedish turnip. A moment of integrity and intellect nestled amidst the inane politics of today. Hard to pass by and not enjoy. Thank you for posting this. This has been my life for forty years.